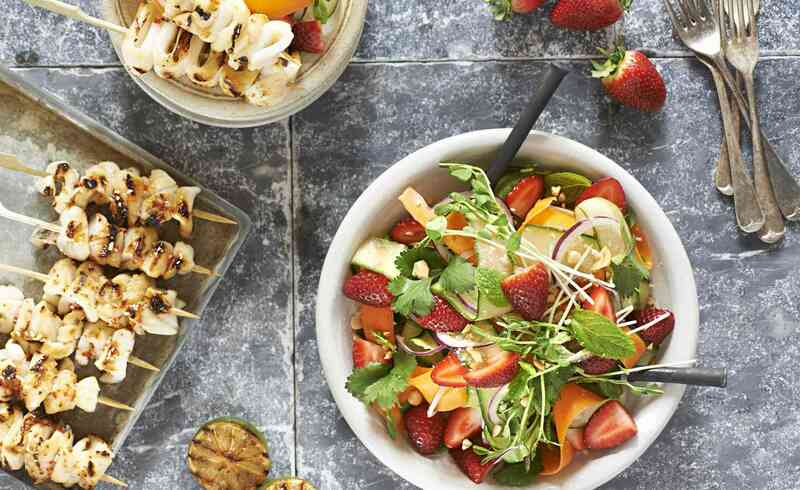 A beautiful fresh salad and squid for those warm summer BBQ nights. Cut the squid tubes open and score a diamond pattern on inside of tubes and dry thoroughly with paper towel. Then cut each squid into three long even strips. Refrigerate in a large bowl while you make the dressing/marinade. Put the palm sugar and water in a small pot and heat gently to dissolve the sugar. Pour into a medium bowl and add the fish sauce, lime juice, garlic and chilli. Whisk to combine. Pour oil and 2-3 tbsp of the dressing over the squid and coat evenly, leave to marinade for 10 minutes. Do not leave any longer as the lime will start to cook the squid and it may toughen. Cut the strawberries into quartered wedges, place in a large bowl. Using a potato peeler, peel the cucumber into thin ribbons down to the seeds. Discard the seeds. Add the cucumber ribbons, the onion, carrots slices, bean shoots and the mint and coriander to the strawberries and toss together. Thread 2-3 of the squid strips on to each wooden skewer. Cook the squid skewers on an oiled chargrill or barbecue over high heat for 1-2 minutes each side until just cooked. Grill the lime wedges to give a caramelized finish. Toss the dressing through the salad and serve evenly onto 4 plates. Top with the grilled squid and sprinkle with toasted peanuts. Serve immediately with grilled lime wedges.